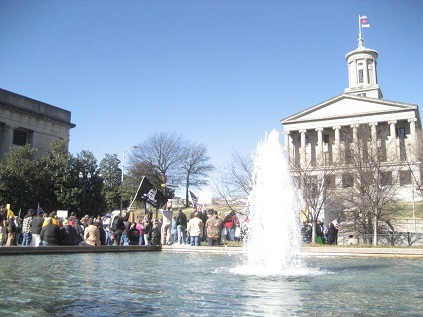 Today at the state capital in Nashville, TN close to 1,000 people have gathered on the Legislative Plaza across from the Capitol building in to show their support for 2nd Amendment US Constitution gun rights. 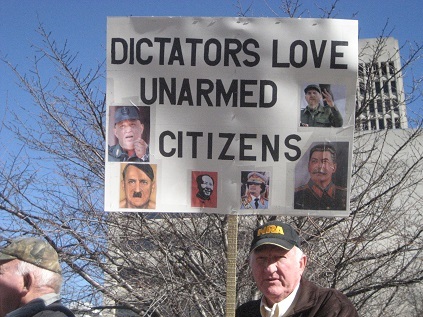 The “Guns Across America” rallies were being held in state capitols across the United States as gun advocates and supporters of the 2nd Amendment used their First Amendment rights to voice their outrage over President Barack Obama’s imperial actions by passing 23 executive orders pertaining to gun control. From Albany, New York to Austin,TX and from Madison, WI to Little Rock, AR, gun supporters made their voices heard that the answer to gun violence was not to take away an individuals right to bear arms and protect themselves. 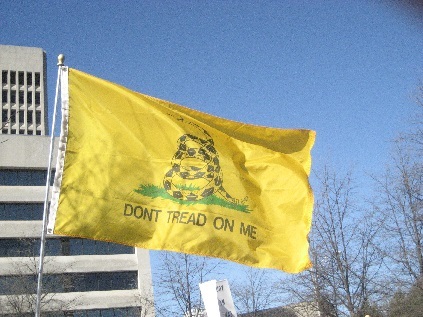 Many supporters in the crowd carried signs in support of their Constitutional rights to bear arms and waived United States and “Don’t Tread on Me” flags. The speakers today in Nashville, TN spoke as one stating that the answer to gun violence was not to blame the guns, but blame the criminals who committed the crimes. How are free, law abiding Americans supposed to protect themselves if guns are taken away from them? 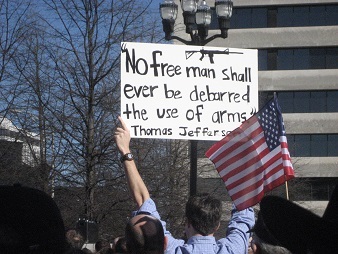 Forget the fact that it is our God given right to bear arms. One of the speakers today was Republican State Rep. Joe Carr of Lascassas who told the roaring 2nd Amendment crowd that “any assault on the Second Amendment is an attack on any amendment.” He also discussed his legislation that would make it a crime for … Carr has introduced a bill, H.B. 0042, that would slap federal officials with a misdemeanor charge for enforcing the new proposals. (1) Ban or restrict ownership of a semi automatic firearm, firearm accessory, or ammunition; or (2) Require any firearm, firearm accessory, or ammunition to be registered in any manner. 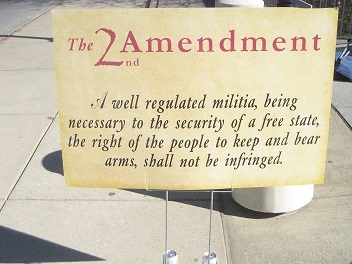 Under this bill, any federal agent or employee enforces or attempts to enforce any federal law, statute, rule, regulation, or executive order as described in (1) and (2) upon a firearm, a firearm accessory, or ammunition that is owned or manufactured commercially or privately in this state and that remains exclusively within the borders of this state will be guilty of a Class A misdemeanor, punishable by up to 11 months and 29 days incarceration and a fine of up to $2,500. This bill requires the attorney general to defend a citizen of Tennessee who is prosecuted by the federal government for a violation of federal law, statute, rule, regulation, or executive order as described in (1) and (2). Internet and YouTube sensation hickok45 also showed up to the even to provide some words of wisdom regarding the 2nd Amendment. Catch him on Twitter at https://twitter.com/hickok45. 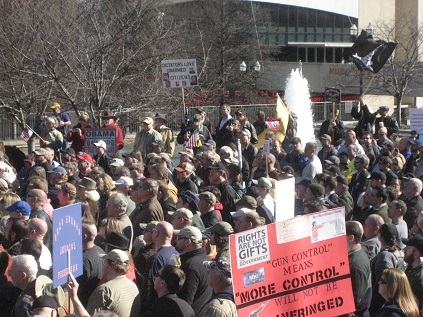 UPDATE I: From the Daily Mail, Thousands of armed protestors gather at state capitols in pro-assault rifle rallies across the country. The size of crowds at each location varied – from dozens of people in South Dakota to 2,000 in New York. Large crowds also turned out in Connecticut, Tennessee, Texas, Utah and Washington state. Some demonstrators in Olympia, Wash., Phoenix, Salem, Ore., and Salt Lake City came with holstered handguns or rifles on their backs. At the Kentucky Capitol in Frankfort, attendees gave a special round of applause for ‘the ladies that are packin’. sorry i had to miss being at the nashville party but they all sure had my spiritual support. cudos to state rep. joe carr for his stand up and be counted efforts on our behalf. Thanks for this article SM. The people are finding themselves in exactly the same place as did the original patriots and the English government. Unless the Washington elite begin to really pay attention, there will be steps like this one to remind them that the states will no longer put up with their overreach. We were there and it was a pleasure. 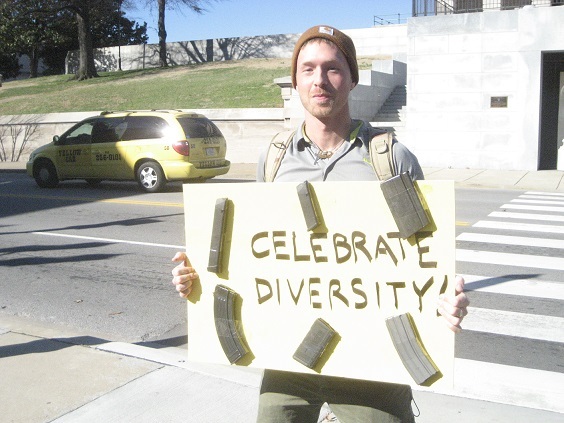 here is our first release from ?Guns Across America, Tennessee, 19th of January 2013. Joe Carr Speaks about H.B. 0042?, followed with a short interview. Amen, Brothers and Sisters. Gee, so my 16 year old Daughter just got threatened to get stabbed by a half Spanish half Black 15 year old thug wanna be gangster in a “gang” from her “hood” of which to be honest, there are no “hoods” in the Suburbs where I live. Point is—–no matter WHERE you live these days- crime and violence and the scourge of society always seems to get in somehow. What if this bully, with a criminal record- DID get to my Daughter and stab her? 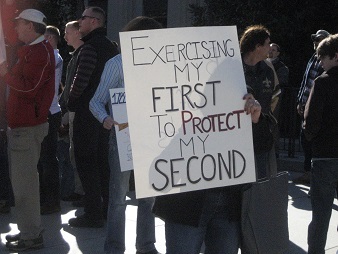 Hell no, NO ONE is going to take away my Constitutional Right to carry. SAY HELLO TO MY LITTLE FRIEND!!!!!!! Now, there is a School hearing on Monday since both my Daughter and the thug who unknown to me had been bullying my Daughter since November for no apparent reason other than my Daughter is a pretty caucasian that hangs around with a popular group? Well, EFF YOU you little piece of crap Thug! I am praying, every day, to God to turn the other cheek and not be a racist- or not to have hate in my heart but I would be lying if I said I wasn’t angry. My daughter defended herself and punched this little b*tch right in her face. If my Daughter is not allowed back in to the School after this suspension, and the thug is—my prediction is my Daughter will be driving a brand new Sports car by next Spring because I will sue the Crap out of the Town/City and the School Board. Oh, and just to be sure- I hired an Attorney. No one, and I mean, NO ONE is going to threaten to stab, cut or knife my daughter and be that aggressive towards her and then tell me my Daughter did not have a right to defend herself.